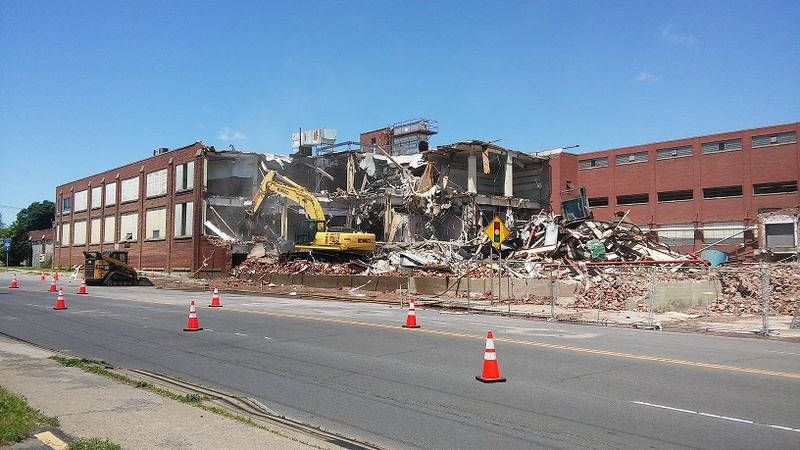 FULTON, NY – The demolition of the former Nestles site in Fulton is being seen by the public again as work continues on the front side of the building lining State Route 481. The demolition of the 24-acre site has been ongoing although it has not always been visible for the general public to see as the buildings in the back of the site required work first to get to buildings they connect to in the front, facing the main road with the most visibility. Currently, Infinity Enterprises is demolishing the most visible portion of the site to have the property ready for the incoming supermarket chain, Aldi. Infinity Enterprises was awarded the demolition contract, offering to complete the work for no charge to the city but instead just the sole rights to all salvageable materials on the site. In a contract with Aldi, the city has until July 1 to have the corner of the property on South Fourth Street and Fay Street build ready. This means, the remainder of the former Nestles buildings in this area need to come down, the demolished materials need to be removed from this area of the site, and crushed brick will be laid in this spot to return the area to ground level. Currently the area is four to six foot below ground level. 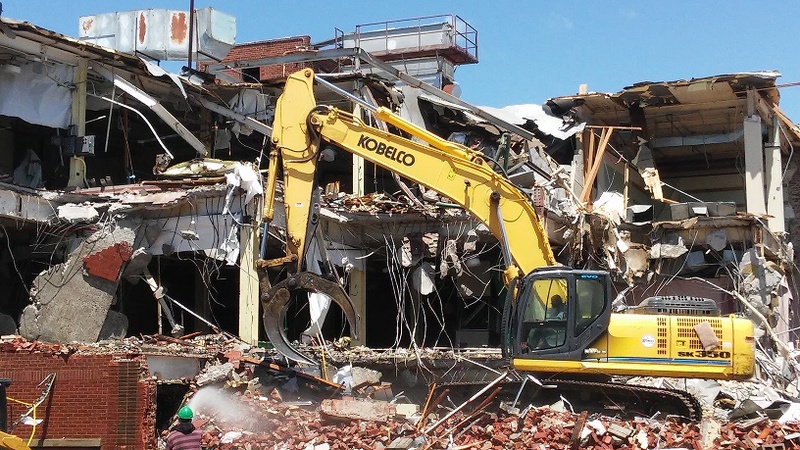 Recently, the Common Council approved the purchase of up to $300,000 worth of crushed bricks bought from Mark Lindsley of Infinity Enterprises to restore the area to ground level after crushing the bricks on site with his own equipment. In a recent meeting with the nearest affected neighbors, city officials and Lindsley addressed the concern of running the crusher during weekday hours. 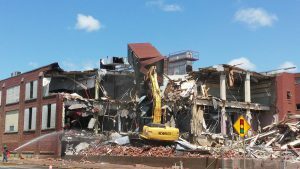 Lindsley said the crusher would only run Monday through Friday between the hours of 8 a.m. and 5 p.m. periodically throughout the summer, not consistently, but had the capability to crush up to 500 tons of bricks in one hour. Realistically, he said, they would likely crush up to 200 tons in one hour. Neighbors brought forth concerns regarding dust being created as the bricks are crushed. Lindsley confirmed that the crusher has it’s own irrigation system that would water down the material and avoid as much dust as possible. Similar concern has been addressed for the demolition overall, in fear that a lot of dust would be circulating in the area. 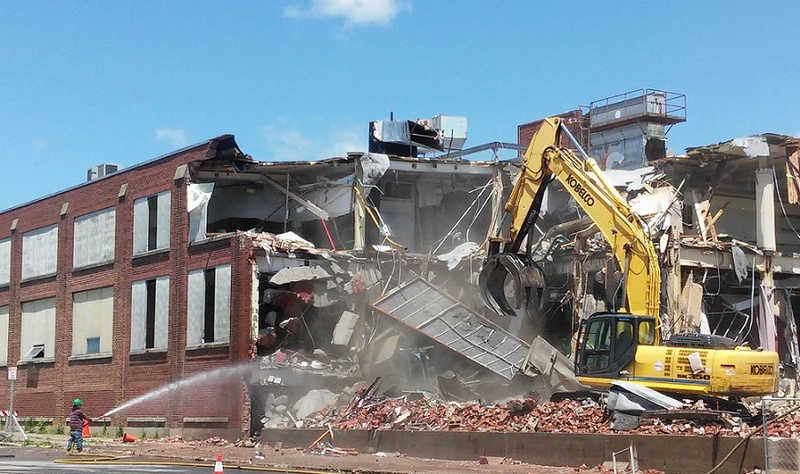 However, Mayor Ronald Woodward Sr. and Lindsley both confirmed that the proper steps are being followed in all aspects of the project, including materials being watered down as the demolition progresses. The only concern from neighbors regarding noise was that the crusher would stay within the EPA limits, which Mayor Woodward confirmed is not an option, but a requirement that will not be exceeded. One neighbor noted, if the noise stays within EPA limits, then it can’t be any louder than when Nestles was in business. As a whole, the group of neighbors agreed that they don’t mind the noise, as long as they know about it ahead of time and what is happening. The neighbors were thanked by the Common Council for their patience over the years and especially recently, and despite some skeptical response due to failed past attempts at demolition, the neighbors were ready to see some action at the site. The progress leading to the current work has been anything but smooth, according to Mayor Woodward. Each building has required asbestos removal before demolition can occur, that is at least three or four floors of asbestos removal in each building. Infinity has been completing the asbestos removal as necessary through each building before they are able to be taken down. According to law however, the asbestos remover can not pay for air monitoring, he explained. For this reason, the city is paying for the air monitoring and Woodward claims each interruption delays the process and costs taxpayers money as the air monitoring continues to get paid hourly even when progress is interrupted. Despite the delays, Infinity moves forward with their progress and are again being seen completing demolition to the front side of the site, visible by members of the general public or those driving by. 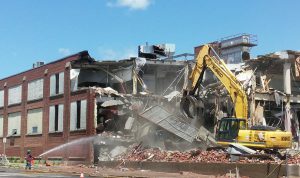 It was necessary to remove asbestos and start demolition for the buildings in the back of the site as to be able to access the buildings in the front and have space to knock the buildings down without pushing them into the road. The focus currently remains on the portion of the site that is guaranteed to Aldi before continuing with the rest of the 24-acre site. “All I’ve got to say is, thank God for Mark Lindsley. The other bid we got in was for $3.2 million, and we didn’t have it. So without him, we would’ve seen it just sit there,” said First Ward councilman, Thomas Kenyon. The mayor and Common Council remain confident that the work will be completed in a timely manner to keep in coordination with the contract with Aldi, who the mayor said would like to have their store open by Christmas of this year. “Here’s the whole thing, seeing is believing,” said Mayor Woodward, with hopes that being able to see more of the process, it will start to resonate with city residents that the work is being done. “There’s no good deed that goes unpunished. For me being here as mayor at 66 years old, I’ve had health issues. My wife says, ‘why are you doing this?’ Because I care about Fulton. I don’t believe some of the nonsense I hear. If you want to make it better, do something about it. Roll up your sleeves and do something. We’re doing something. It may not be going as fast as some people want, but we’re making headway,” said Mayor Woodward. These “neighbors” are the same folks who would rather the old building sit there vacant so they can sit on the front porch and remeber the way things used to be. 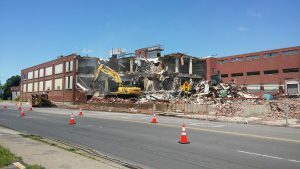 Wake up old people, Nestles is gone as is 99% of the economic industry in Fulton. Much of the old Fulton needs plowed over to make way for a new city. Too many people are stuck in the past, stuck on welfare, or stuck just complaining instead of being part of the solution. Seems to me that would be just “an assumption” on your part Eric since all of the concerns mentioned would seem to be somewhat justified by those living in the closest proximity to the building. Please don’t blame all of Fulton’s problems on the “old folks”. As I see it, it’s probably more a case of it being the other way around from what I read in the police blotter on this very site. Holy bajepus ! They’re building a small grocery store on the corner and everybody is acting like it’s a skyscraper. You understand when Aldi’s opens two other small grocery stores in the city go out of business! That’s the type of progress the Mayor is responsible for, he needs to go home and not come back, give somebody else a chance. The Nestle plant would have probably been put to better use if it had been converted into a county jail. They could have put “chocolate bars” on the windows, and that would have solved many problems Nestles Quik. Ok just some facts…it has taken 191 days to take down 5 1/2 Bldgs. and they want us to believe that in 21 days they will take down 5-6 more and level the site for ALDI’s…those that believe that are one’s that keep voting for the Mayor we have a the CC we have..Fools..Also a grocery store isn’t going to save the city. It is going to be nice but a savior it’s not…wake Fulton…my prediction is ALDI’s won’t break ground until Feb. of next year and at $100,000 less than the check they wrote. I have lived in Fulton all of my life. I have seen many changes happen but I have never seen it this bad. We are in a situation where aggressive changes are needed. I have read over the years Fulton has cut payroll to save money but that is not enough. Instead of looking at how we can cut to save money why not look at how we can expand. We have services that can be offered outside the city limits. Why do we not hold department heads accountable for their failures? If this were a business and an employee was not doing their job they would be terminated. Take for instance our codes office. There has been no code enforcement for years. Buildings are unsafe and homes are dilapidated. So instead of holding him accountable we bring in another person for the CDA to try and make improvements. Why not just get rid of him? Our young people are leaving as fast as they can. There is nothing here for them! We have a large majority of tax exempt properties that are receiving the same services that our small population of taxpayers are receiving. In Syracuse the mayor has started an aggressive movement to get tax exempt properties to start paying for the services they receive. Why are we not doing that here? Welfare is out of control. Over 53% of the people are on some sort of social services. How did we allow this to reach this level? Is the whole system to blame? The leadership has to start making changes that the taxpayers can see. Reduction in not only property tax but reductions in schools taxes. Bringing more retail to the downtown area, which is a disaster. We have very little retail in the city but plenty of tax exempt properties. Let’s get our business leaders involved and listen to some of their ideas. Our administration is stale and needs to move in a different direction. We will never get manufacturing back like we had in the past but we can make aggressive changes to make Fulton a better and cleaner place to live. Let’s all try to work together and make things happen. It’s a shame all of the lost industry around here. Is Aldi’s going to offer a livable-wage job, 401K plan, profit-sharing, decent benefits, paid time-off/holidays/vacations?…may offer a couple but surely not all! Taxes/fees go way up & incomes go way down…a recipe for disaster! it dont matter what they do. its fultons biggest mistake. they couldve done more useful like make a mall out of it scince nestle was the biggest part of Fulton. or out another factory there. we need more shopping other than walmart. look at the old P&C plaza totally useless. maybe if big names came in like dicks or gander mountain or any other Fulton would have had a chance i Fulton is just like mexico dead. Malls have been a dead end business proposition for years. There simply isnt the economic base in/around Fulton to drive a mall or any other factory. If chocolate, beer, glass, and vegetable giants cant make it in Fulton – who can? Every strip mall in Fulton has either gone under or has been repurposed by tenants who are not retailers. The old Nestles building is simply a painful reminder of a bygone era. Plow it under, get over it, and move on. In 10 years most of the current population will hardly remember where it was or what it stood for. BTW Lester, the millenials who now call Fulton home are simply products of their environment. They didnt bring Fulton to its current state of disarray. Those initial decisions and subsequent inaction are the product of people back in the 70s and 80s. Therefore thats right inline with folks like the Mayor. If they offered to do. It for free,then why is the city buying$300,000.00 worth of bricks that are already there,so in reality,it’s not free.Something doesn’t add up!! !